Melissa DuBose casts a net out into the sea on a crisp winter morning, from a wooden pier near the Golden Gate Bridge in San Francisco. “I come out here every week,” she says. She reels in her net to collect her catch, which appears to be only water, captured in a small bottle dangling from the bottom of the net. DuBose collects sea creatures so small most people never notice them, yet they are critical to all life in the oceans and on land: plankton. The word plankton comes from the Greek word planktos, which means drifter, or wanderer. Which is precisely what plankton are. Tiny wandering plants and animals, drifting at the mercy of ocean waves, tides and winds. The technical definition of plankton is anything that lives in water and isn’t strong enough to swim against the current. DuBose immediately brings the plankton she collects to a microscope in William Cochlan’s laboratory at the Romberg Tiburon Center, San Francisco State University’s marine lab in Marin County. Cochlan and his lab members study phytoplankton, tiny marine organisms that collect energy from the sun through photosynthesis. “Because we can’t see them without microscopes they’re kind of invisible to us,” Cochlan says. But magnified, their beautiful shapes and colors are revealed. Diatoms are one of the most common types of phytoplankton, and they are known for making silica (glass) cell walls, in an amazing variety of shapes and sizes. 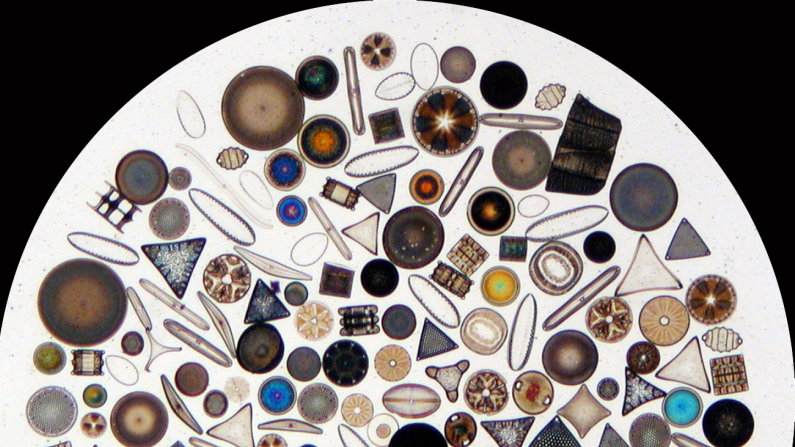 Diatoms aren’t just beautiful, they’re essential to life on earth. Phytoplankton produce 40 to 60 percent of the oxygen we breathe, and in the ocean they are the base of the food web. Cochlan wants to know how these microscopic plants will be affected by changing ocean conditions, brought about by the billions of tons of carbon dioxide we emit into the atmosphere every year. The gas traps heat, slowly warming the sea surface. But it also changes the ocean’s chemistry. About a third of the carbon dioxide we emit is absorbed by the oceans, where it reacts with seawater to make it more acidic. As the level of carbon dioxide in the atmosphere has gone up over the past century, the ocean’s acidity has increased by about 30 percent, according to the National Oceanic and Atmospheric Administration. “We really have to find out if ocean acidification is going to negatively impact the phytoplankton,” Cochlan says. In his lab, researchers are growing phytoplankton in water treated with high levels of carbon dioxide. “We’re specifically trying to see if ocean acidification increases their growth rate or slows it down,” he says. So far, the scientists have seen that in some cases phytoplankton grows faster in water with high amounts of carbon dioxide. But Cochlan cautions that growth rate isn’t the only indicator of health, and there could be negative impacts that they haven’t detected yet. “The jury’s still out,” on how increasing carbon dioxide will affect phytoplankton, he says. Not all plankton depend on carbon dioxide to grow. There is another class of drifters, that act more like animals than plants, called zooplankton. Zooplankton mostly eat phytoplankton, though they sometimes each other. 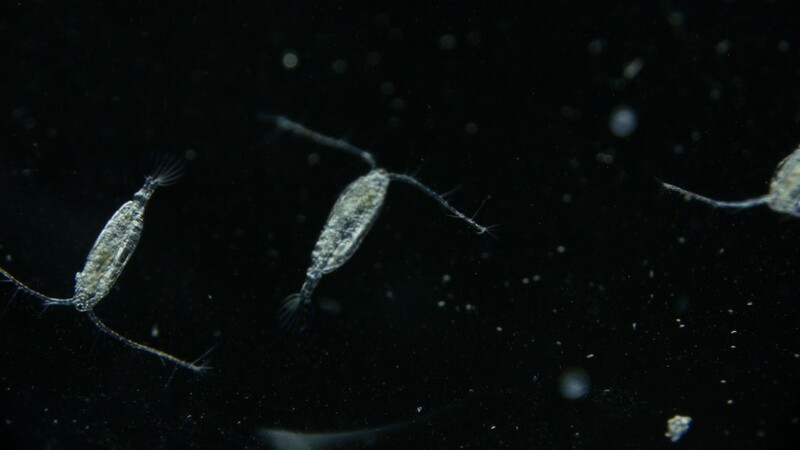 Zooplankton include all drifting sea animals, from jellyfish to crab larvae. One of the biggest and most plentiful type of zooplankton is krill. They are only about the size of a paper clip, but abundant enough that enormous animals, like blue whales, can survive on a krill-only diet. 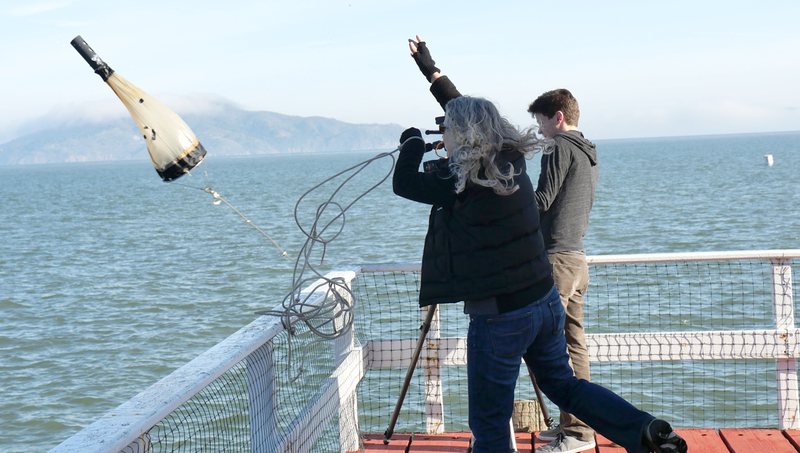 One of the reasons there are so many whales in the waters off the Golden Gate, Cochlan says, is that this area is home to a high density of zooplankton. The high density of zooplankton is supported by an ocean process called upwelling. Upwelling is caused by winds stirring up the ocean’s surface, forcing warm surface waters away from shore and bringing cold water up from the deep. Deep water is full of nutrients, because the bottom of the ocean is where everything marine goes to die and decompose, breaking down into material for new life, like a compost bin. (Via wikimedia-modified by D. Reed from image by J. Wallace and S. Vogel, El Niño and Climate Prediction. Image courtesy of Sanctuary Quest 2002, NOAA/OER). 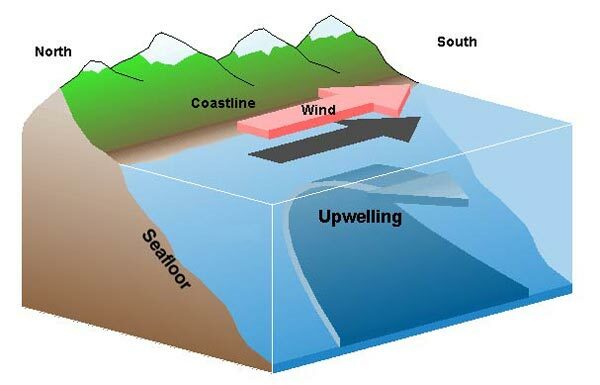 Upwelling happens when offshore winds push water away from the coast, and water from the deep comes up to replace the displaced surface water. The infusion of nutrients sparks an explosion of life at the surface, starting with the phytoplankton. Most phytoplankton are single-celled organisms, and they reproduce by dividing into two new cells. “Typical phytoplankton divide once, doubling per day,” Cochlan says. But after an upwelling, they rapidly accelerate their growth rate. More phytoplankton means more food for zooplankton, which are prey for small fish and big whales. We usually only witness this feeding frenzy from the ocean’s surface -- flocks of birds congregating, whales and dolphins diving. But the fuel driving all this energy is below the waves, and too small to be seen. The future of these episodic bursts of productivity is unclear. A paper published last week in the journal Nature predicted that warmer waters and stronger winds will increase upwelling. But the paper’s authors say the separation between warm surface waters and cold deep water could also increase, so the upwelling might not bring up as many nutrients. It is still unknown, they say, how future changes in upwelling will affect marine life. Humans need plankton, but most people go through life without seeing one up close. Plankton are the unsung heroes of the ocean -- the tiny, beautiful, lungs of the planet and food for the sea.